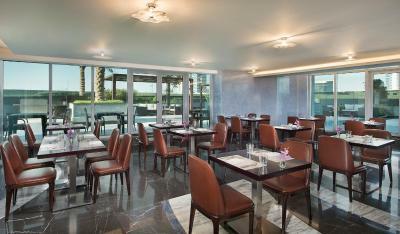 Lock in a great price for Atana Hotel – rated 8.7 by recent guests! It’s very helpfully staff . We came early but they provide a room free. Specially thanks for Mr.Jet for kindness and excellence service. Excellent reception Staff, including Osama, romi, and Jet. The food was normal and its required some changes. I liked everything about the hotel. Everyone was just so sweet and took very good care of every requested I asked for. I would like to give a special thank you to Jass for checking me in and finding a room so quickly... I can forget Jass lovely smile. Rabab for taking all my great photos and giving me tips on how to wear my Abaya. Also thank you, Emilia, Paschal, and Ehab on taking care of my bags, directing me in through the hotel, and most of all doing it with a smile and making me feel very welcome. I'm looking forward to seeing everyone next year!!!! Loved the staff! Very welcoming. Great customer service. great value for money, hotel room and lobby very clean and modern, housekeeping is very efficient we stayed on the 10th floor the phillipino housekeeping boy was so cute and good at his job, breakfast was ok plenty of selection, pascal the doorman very helpful. close by to the metro station about 10 mins walk, supermarket just next door and there is always taxis right outside as well as shuttle service to many places. 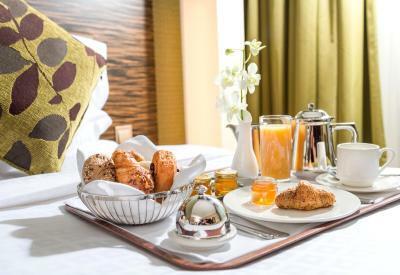 I used to stay in Atana hotel because it very clean, with a great location and tasty breakfast, special thanks to staff in the reception (rabab and Jiss) for upgrades my reservation in order to early chick in .. Definitely it will my next stay.. The facility is great, loved the swimming pool and the lobby with different restaurants. The beds we extra comfortable. The shuttle service was my highlight, coming from SA, it would have cost is an arm and a leg to move around but the shuttle service made our lives easy. Atana Hotel This rating is a reflection of how the property compares to the industry standard when it comes to price, facilities and services available. It's based on a self-evaluation by the property. Use this rating to help choose your stay! 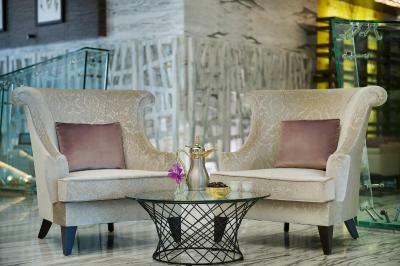 One of our top picks in Dubai.This new 4-star hotel in Dubai is a 5-minute drive from Mall of Emirates. 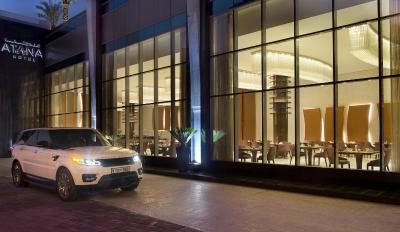 Atana Hotel provides free parking and free WiFi. 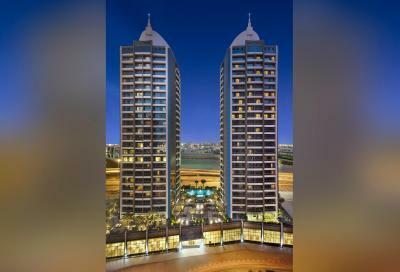 The hotel also offers complimentary shuttle bus to Mall of Emirates, Jumeirah Beach, DIC Metro Station and many other landmarks. 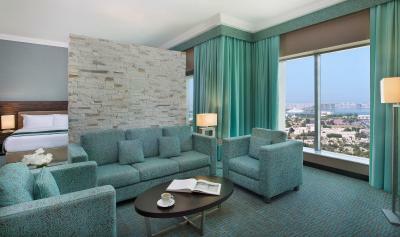 Modern Rooms and Suites are bright and decorated in warm colors. All elegant rooms are furnished with LCD TVs. 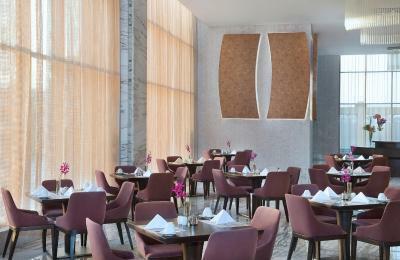 Each offers complimentary tea and coffee making facilities. 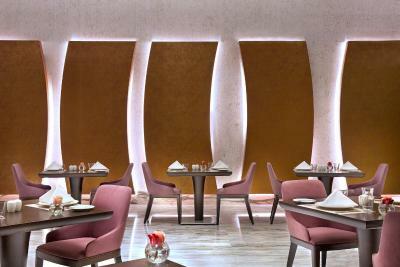 Dining experience features 3 dining outlets which offers variety of lifestyle and all day dining restaurants, Piano Cafe Lounge, food outlets & 24 hours room service. 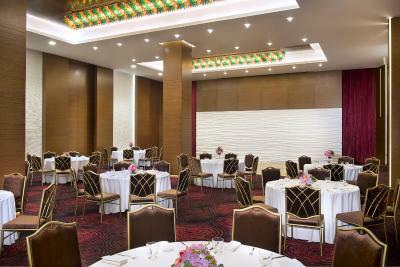 The Hotel features epic design of extensive grand ballroom with modular possibilities, conference facilities, banquet hall, meeting rooms, and shopping arcade on the entire ground floor. 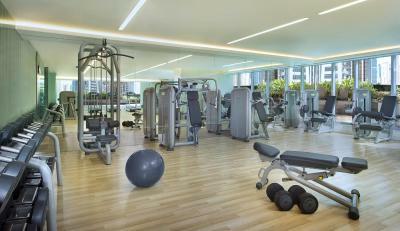 Leisure facilities include outdoor recreation swimming pool with sun terrace and a fully equipped fitness. 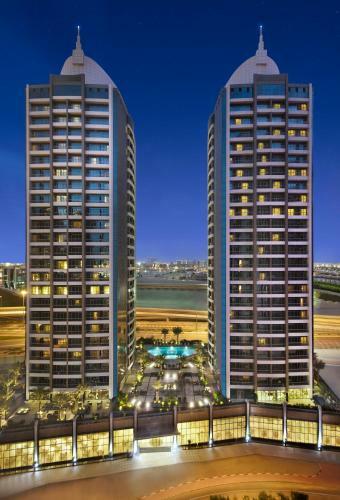 Dubai internet city metro station is 8 to 10 minutes walking distance from the hotel. 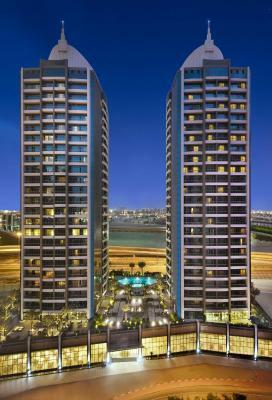 Barsha Heights (Tecom) is a great choice for travelers interested in beaches, sightseeing and tourist attractions. 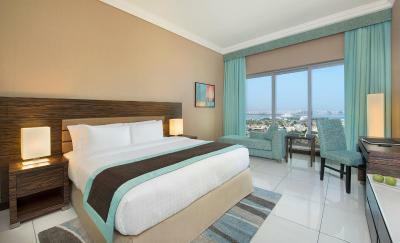 When would you like to stay at Atana Hotel? This air conditioned room offers free WiFi, a seating area sofa and a TV. The bathroom is fitted with bath or shower and includes complimentary toiletries. This air conditioned triple room offers free WiFi, a seating area sofa and a TV. The bathroom is fitted with bath or shower and includes complimentary toiletries. 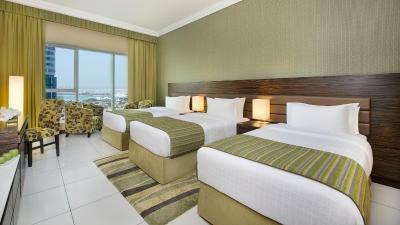 This air conditioned Deluxe Room offers free WiFi, a seating area sofa and a TV. The bathroom is fitted with bath or shower and includes complimentary toiletries. This 2 bedroom Suite offers 1 bedroom with a King sized bed, 1 bedroom with 2 twin beds and a separate living area with a flat-screen TV and Sofa. 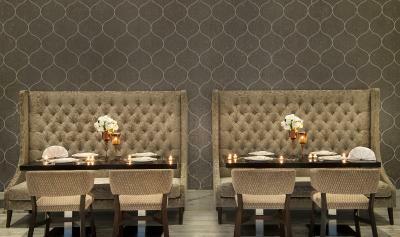 The dining area has a dining table with 4 chairs and a console table. This 2-bedroom suite comes with 2 and half bathrooms including a half bathrooms fitted with bath or shower and includes complimentary toiletries. 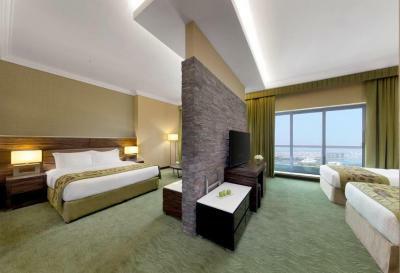 This suite offers views towards Sheikh Zayed Road. It is generously sized with a contemporary decor. 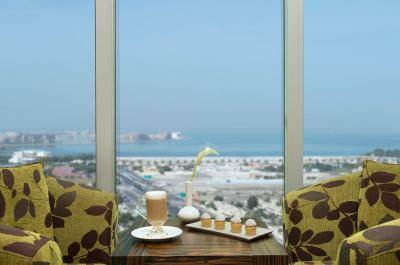 It includes a complimentary coffee and tea-making facilities. A living area with spacious bathroom features double vanity with W/C and bidet as well as separate shower and bathtub. 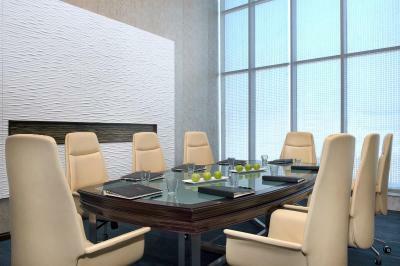 It comes with high-speed wireless internet access, flat-screen TV, in-room safe and mini-bar. This Family Interconnecting room features 2 bedrooms with custom-made extra large size beds. 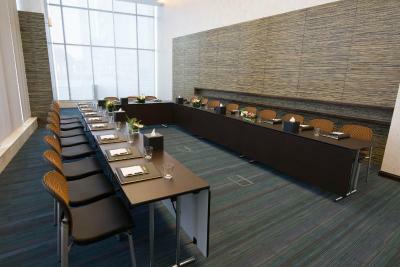 Room facilities include a safe, air conditioning, desk, ironing facilities, sitting area and a minibar. 2 bathrooms are offered at this room type and are fitted with a shower and bathtub. 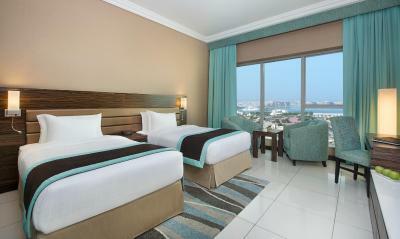 This is air-conditioned spacious room is enough to accommodate a family of 4 adults or 2 adults and 2 children. It has one full bathroom with shower and tub and includes free toiletries. 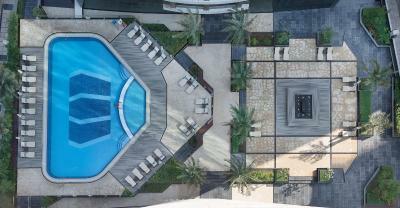 Atana is a new hotel with 828 rooms, conveniently situated on Hessa Street in Al Barsha South, and at close proximity from Dubai’s business centers and major tourist attractions. The property combines comfort and convenience with warm service and a range of thoughtful amenities to make you feel right at home. 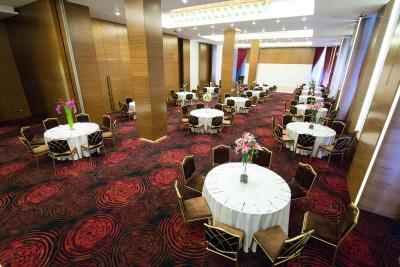 With a wide choice of elegantly furnished rooms and suites, a variety of restaurants to suit every taste, a health club, a pool and a spa to unwind and revive the senses added to a fully equipped business center, meeting rooms and ballroom, no matter if you’re on a quick business trip or a relaxing holiday, Atana Hotel delivers. 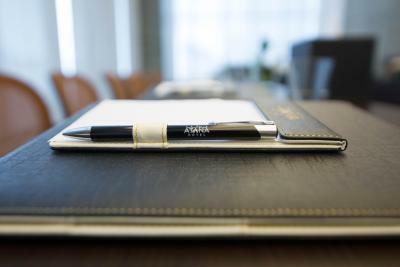 House Rules Atana Hotel takes special requests – add in the next step! Atana Hotel accepts these cards and reserves the right to temporarily hold an amount prior to arrival. Please note that all guests must present a valid ID prior to the guest check in. An Emirates ID or Passport is accepted. 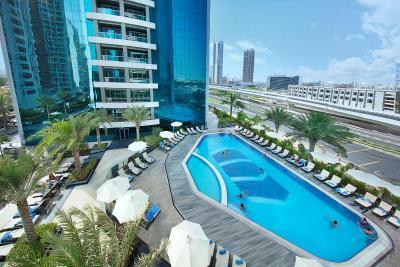 Atana Hotel offers complimentary bus service to Dubai Internet Metro Station and to the Beach for all hotel guests. There is also complimentary shuttle service to City Walk, Jumeirah, Outlet Mall, Outlet Village, Mall of the Emirates, Mercato Mall, Umm Suqeim Beach, Al Seef, La Mer and Jumeirah Beach Residence. 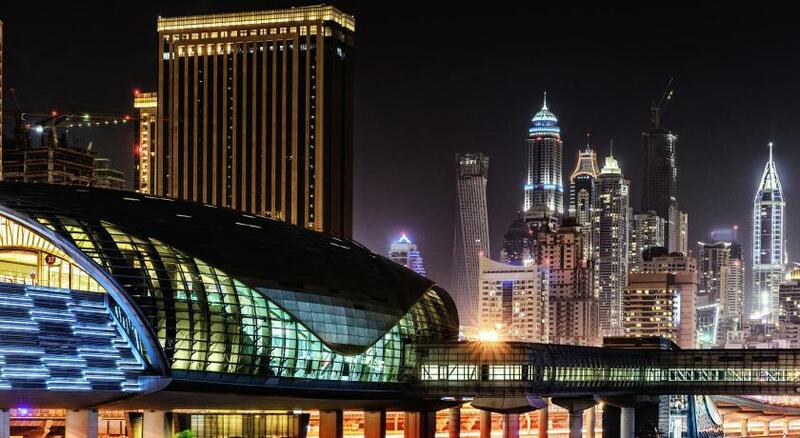 Atana Hotel is just a 7 minute drive to Dubai’s many shopping and tourist attractions like Mall of the Emirates and Ski Dubai. 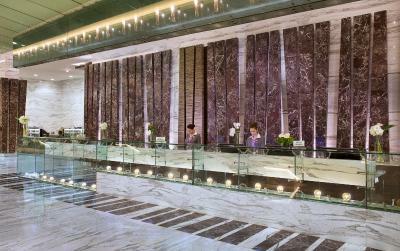 Please note that there will be a refundable deposit fee of AED 200 upon check in case of any damages or extras. Please note that there are certain timings and schedule set for the shuttle buses. Kindly check with the property upon arrival. 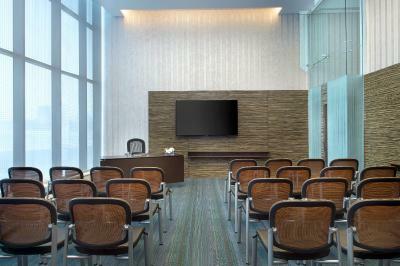 Please note that the furniture and color schemes may vary from the photos. Please note that after check-in, the property will charge an extra night for amendments made to the booking. Please inform Atana Hotel of your expected arrival time in advance. You can use the Special Requests box when booking, or contact the property directly using the contact details in your confirmation. Excellent hotel and very helpful staff who went out of their way to meet all our needs. All staff including Das in the restaurant and reception staff were very welcoming to us . Everything was great.clean.the food was very good.close to the metro.nice staff.free water everyday in the room. I think the breakfast options could have been a bit better, although there was a lot to choose from; There were more salads and curries thank "breakfast" options. Other than that, This Hotel doesn't serve alcohol so would be worth noting this on the website. This is the 2nd time I have stayed here. This time I only stayed for one night. I generally like the Hotel Cleanliness and suitable to travel on business, but it's easily accessible by taxi etc around Dubai. It's budget friendly and the staff are friendly and welcoming. Evening buffet had variety and choice and good quality. The hotel is clean and not far from the metro. Special thanks to KHALID for his kidness in the swimming pool. Nothing to complain about except I would have liked the room air conditioning a bit cooler. Maybe ours was faulty? Public areas were cool. Good location - 10 mins walk from Metro, which is cheap and easy to use. 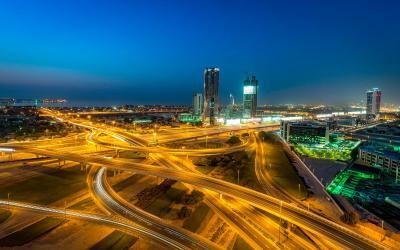 Two stops in either direction to Dubai Marine, and Mall of the Emirates. 20/30 minutes will get you to downtown Dubai, the Burj Khalifa and the Creek. Food generally very good - breakfast and dinner both buffet style with a very wide and varied choice of hot and cold dishes, salads, desserts, soups. Room - spacious and clean. Serviced every day. 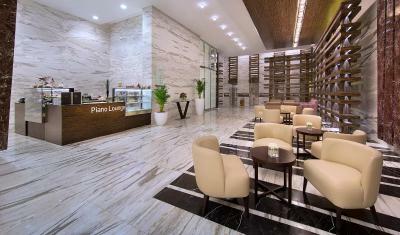 Great lobby and superb staff on reception, concierge, etc. Very efficient check in and check out. Pool area and gardens/terraces really nicely set out, clean and tidy. 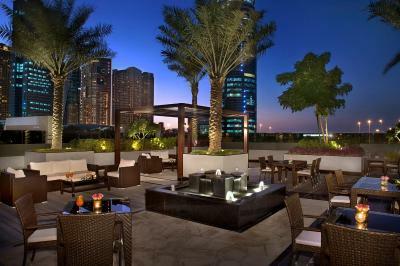 Given that Dubai is generally pretty expensive, this hotel is definitely good value for money. 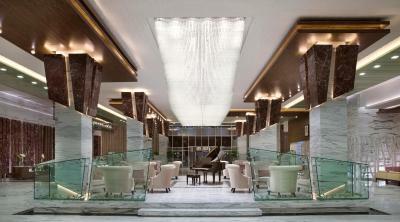 Atana is a Well designed building and service-oriented Hotel. It is really a nice place. The personnel are really friendly and professional. 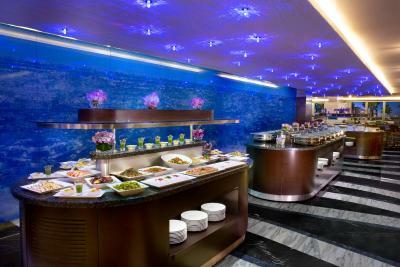 The food in the buffet is excellent. Greetings to Abdul in HC restaurant. Special thanks to the valets . Much thanks for Paula and Sohaib and Alex for their assistance, care and precious advice. I Do recommend the place. You have anything you could need and willing to make your stay enjoyable personnel. The location of the hotel is convenient. It is closer to the Internet City metro station. From that point, it is easy to move to another location in the city. The buffet from the hotel has international food and the window time for the meals is too ample to don't have problems to adapt it to your schedule. The staff is friendly, and always they are trying to help you. We want to give a special mention to Godfrey from the restaurant. He was really kind and attentive and also he always had a smile in the face. He is a good guy and a good professional! For sure we recommend the place! The room decor was a little dated (orange) and the lift situation was a little frustrating as we were on the 21st floor which was nice but getting down was a mission with so many people getting in and out of the lifts - it almost stopped on every floor down. But not something that affected our stay. Shame we couldn’t stand out on the balcony. We received an upgrade to a suite and it was nice and spacious. Foyer was pleasant and pool was lovely and warm. Staff that were especially helpful were Osama, Emilia and Romia. Not enough options for snacks in the lobby. The prices at the lobby snack bar and extremely high. We had a wonderful stay at the Atana Hotel. The hotel staff is amazing and they are constantly looking out for you to ensure you have everything you need and help with any requests. We arrived early and Jet from reception was able to provide us with a room before check-in time and he followed up with us every time he saw to to make sure we were satisfied. The room was impecable and the beds were amazing.